Summer time TV is deadly. Soccer's done. There's the dance show, but it's sucking badly this season without the crazy Mary Murphy. The only thing on my DVR is Tony Bourdain's No Reservations. Confidential was a fun read about kitchen culture, which laid the foundation for all those cooking competition shows. There would be no Hell's Kitchen without Kitchen Confidential. The Food Network should send him royalty checks. 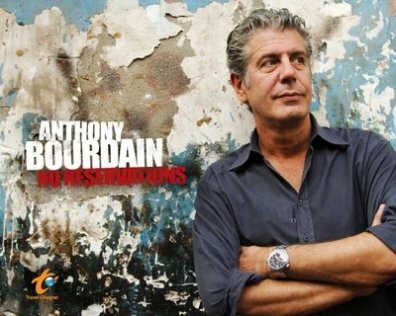 No Reservations showcases Bourdain's ability to swallow just about anything without triggering the gag reflex. It enables him keep spouting his purple prose about bone marrow and fish heads. You don't always walk away from the show with a hankering for a light meal of live octopus, but you do get carried up in his enthusiasm for food and drink. He has a lust for life. For traveling the corners of the world to get drunk with strangers and for find something extraordinary in a food cart in Denver. It's good to find one show on TV that captures the real spirit of adventure, especially in a time of pseudo-reality shows and laugh-less sitcoms. I love that show, but always forget to record it. On the plane, they had an episode where he visited the rust belt. It was really awesome. Pierogis, fried fish, crabs (from Baltimore), middle eastern food, he ate it all. I think a lot of people assume Bourdain is just all about eating weird food. To the contrary he’s all about eating the food that is unique to a locale and if that is ‘weird’ he’ll try it. I love though the way that he does his best to paint each place in a positive light and I love that he tries to highlight the great food avergae people make in their kitchens as well as the cutting-edge stuff being produced in 4-star restaurants.